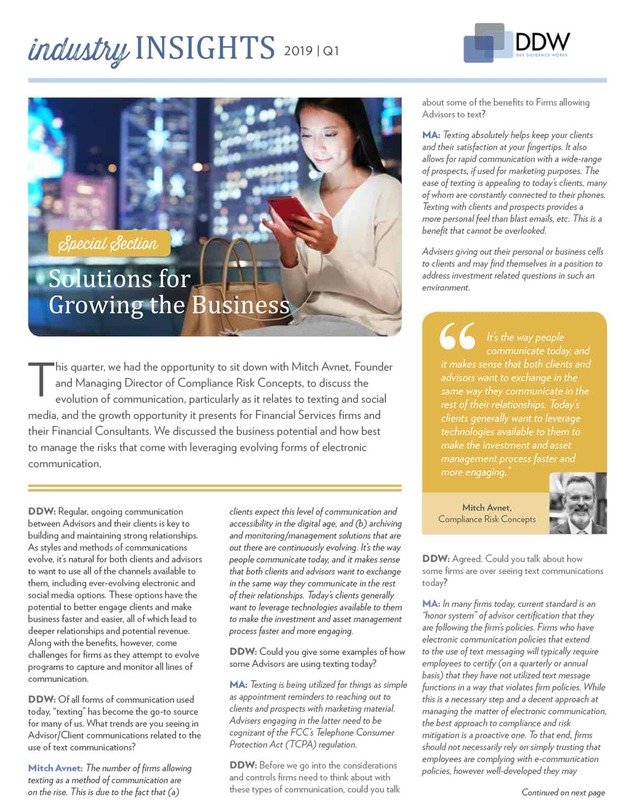 Due Diligence Works, Inc. (DDW) sat down with Mitch Avnet, Founder and Managing Director of Compliance Risk Concepts, to discuss the evolution of communication, particularly as it relates to texting and social media, and the growth opportunity it presents for Financial Services firms and their Financial Consultants. They discussed the business potential and how best to manage the risks that come with leveraging evolving forms of electronic communication. The following is an excerpt from the interview titled Texting and Social Media with Mitch Avnet. Click here to read the full interview. DDW: Regular, ongoing communication between Advisors and their clients is key to building and maintaining strong relationships. As styles and methods of communications evolve, it’s natural for both clients and advisors to want to use all of the channels available to them, including ever-evolving electronic and social media options. These options have the potential to better engage clients and make business faster and easier, all of which lead to deeper relationships and potential revenue. Along with the benefits, however, come challenges for firms as they attempt to evolve programs to capture and monitor all lines of communication. DDW: Of all forms of communication used today, “texting” has become the go-to source for many of us. 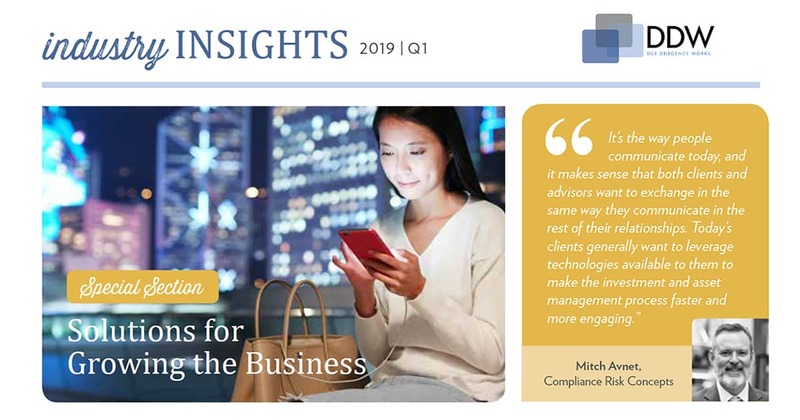 What trends are you seeing in Advisor/Client communications related to the use of text communications? Mitch Avnet: The number of firms allowing texting as a method of communication are on the rise. This is due to the fact that (a)clients expect this level of communication and accessibility in the digital age, and (b) archiving and monitoring/management solutions that are out there are continuously evolving. It’s the way people communicate today, and it makes sense that both clients and advisors want to exchange in the same way they communicate in the rest of their relationships. Today’s clients generally want to leverage technologies available to them to make the investment and asset management process faster and more engaging. ABOUT DUE DILIGENCE WORKS, INC.
Due Diligence Works, Inc. supports RIAs and Broker-Dealers to provide ongoing Due Diligence of investments and insurance products, Product Shelf Management, helping firms review the entire universe of products (not just platform); ensuring firms have the best products on their shelf and can prove it. All in a variable cost and conflict fee model that can bring down cost, improve quality, and stand the test of regulatory scrutiny.